The following information was collected by Mr. Siepermann who in 1983 contacted Ross McLachlan and along with a local historical group put together the events of the night the Halifax came down and the days following. The article has been edited for a website by 419squadron.com. Our Thanks to Mr. Siepermann for allowing us to share his article and photos. On June 24th, 1943, H.Q. No. 6 (RCAF) Group received instructions to deliver 63 bombers to Bomber Command in order to carry out a mission to the Wuppertal area in Germany. The scheduled target was Bayer AG/Farben in the notorious Ruhr valley, close to the villages of Barmen en Elberfeld. The Daily Operations Report of No. 6 Group RCAF, reads; 37 Halifax from 408, 419, 427, and 428 Squadrons were joined by 38 Wellingtons from 429, 431, and 432 Squadrons on an attack at Wuppertal. The crews were over the target at between 12,000 and 20,000 feet, releasing 96,000 lbs of high explosives and 188,000 lbs of incendiaries. According to reports, bombing was accurate and severe damage was caused. This attack was aimed at the Elberfeld half of Wuppertal, the Barmen half of the town having been devastated at the end of May. The Pathfinder marking was accurate and the Main Force bombing started well but the creep back became more pronounced than usual. The attack was devastating, doing more damage than the earlier attack on Barmen, 13 large and 137 smaller factories being partially or wholly demolished. At the end of this attack a survey of all of Wuppertal revealed that 80% of the businesses and residences in the cities were destroyed or badly damaged. There were 98 NJ (Nachtjagdgeschwader Luftwaffe Night Fighter Groups) sorties of which 52 obtained intercept, costing the RAF 33 bombers. 30 aircraft bombed targets in more western parts of the Ruhr; Wuppertal was at the eastern end of the area. These bombing failures were probably a result of the recent run of intensive operations incurring casualties at a high level. However, much serious damage was again caused to this medium-sized Ruhr town. The post-war British survey estimated that 94 per cent of the Elberfeld part of Wuppertal was destroyed on this night. Among the 63 bombers, were 16 bombers of No. 419 "Moose" Squadron (RCAF), they took off from RAF. This squadron was based at the airfield Middleton St. George (called Durham Tees Valley Airport at present) in Durham, the squadron was equipped with Halifax. 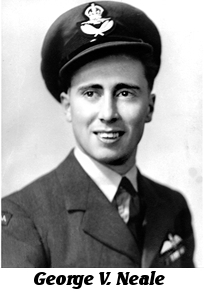 That night three of these Canadian bombers failed to return to base: the plane of Squadron Leader Burton Norris Jost, DFC (JD147 VR-C) came down at 01.30hrs near the town of Herten (close to Roermond), a Halifax piloted by Sgt R. Whitfield (JD358 VR-.) crashed at 01.06hrs, near the village of Acht (Holland), the last Halifax that was lost, was the JD214 (VR-U) of Sgt George Victor Neale. The Halifax of Sgt. George Neale crash-landed near Indoornik, South-West of Arnhem. Indoornik is a small village between Lexkesveer, a ferry station on the southern bank of the River Rhine, and Zetten, a village on the road to the River Waal. The crash-landing of JD214 was, to say the least, an almost incredible example of utmost pilot-skill combined with a lot of good luck. Therefore it is worthwhile to record here the complete history of this plane and the crew, in particular during and after her last flight. The aircraft was a Handley Page Halifax B/Gr. II, built by Electric Co. (Salmesbury & Preston) and serial number JD 214; it was allocated to 419 Squadron in April 1943, coded VR-U, and made more than 25 sorties over France, Germany, Italy and the Low Countries . The flying horse Pegasus, also the symbol of the well-known First British Airborne Division, was painted on the port side of the nose of JD214. It proudly galloped over a long row of bombs, stating the impressive record of the Halifax operations. The information on JD214 being "Pegasus" is not correct. JD214 first appears on the squadron ORB log on June 11/12 1943 and only flew six sorties between then and being lost on July 24/25th. The previous "VR-U" was JB862 which was lost on the night of May 23/24th. on it's ninth operation. There were no other VR-U Halifax aircraft. Another photo supposedly taken of JD214 in the field were it crashed is hard to make out any details such as nose art, only the "VR" shows faintly in this small sized photo found on this site of aircraft that crashed in the Netherlands. This information is only now available. So the photo of Pegasus with it's 25 ops. marked on it is not JD214 or JB862. 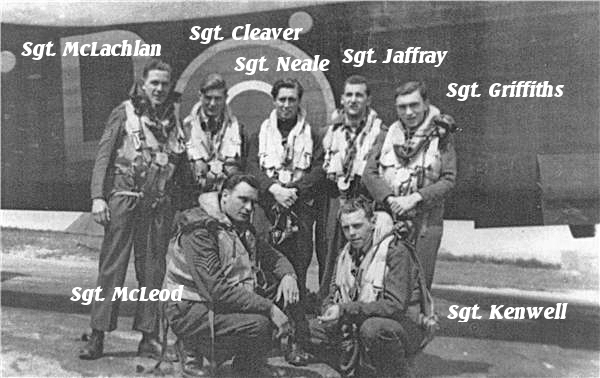 The crew of JD214 consisted of five Canadians and two Englishmen, flying together as a team since April 1943. On June 24th, at 22.40 hrs, the Halifax of Squadron Leader Jost was the first plane that took off from Middleton St. George; the other aircraft followed till the whole force was airborne at 23.15 hrs. The task of the Squadron Leader was not easy, he had to take care of the assembly of all planes into a loose formation, each plane at the correct altitude at the correct time. The assembly point was at 54.53' N, 0.30' W, over the coast of Yorkshire also. At this position the pilot of Halifax JD 215 (this aircraft was lost on June 29th, 1943, over Holland), P/O A. Reilander (428 Sqdn RCAF), reported problems with a starboard inner engine, and was forced to return to his base. The other planes set course to the South-East: along the British coast and then over the North Sea to the Dutch islands of Zeeland. At this position the bombers changed their course to the East and flew roughly along the Dutch/Belgian border to Germany. When Halifax JD214 approached its target in Germany, the plane was suddenly attacked by two or three German night-fighters, presumably being Focker Wulf 190's. The Halifax was hit in the starboard wing and in the outer starboard engine. The engine started burning, lost its propeller during this process and had to be switched off. In the meantime the bombs were jettisoned and the pilot tried to escape by making evasive actions. It was in vain, the night fighters could trace the bomber easily because of its burning engine and they attacked for the second time. This time many bullets perforated the fuselage and the port wing, causing Sgt Ross McLachlan a wounded to his arm. The outer port engine was set to fire and the nose blister was seriously damaged. During this attack the rear gunner, Sgt McLeod, managed to hit one of the fighters which went down in flames. The other night fighters then disappeared, presumably because they assumed the bomber was doomed. Although the attacks caused no serious harm to the crew, the general situation on board of JD 214 was far from pleasant now. During the fight the Halifax was forced down from 20,000 to 9,000 feet and with two engines turning and two burning, there was hardly any chance of returning to base. Fortunately the fire in the engines, after being switched off, were almost extinguished. Therefore the crew decided to make a try and captain George Neale started following the river Rhine, which was classily discernible, on the journey home. In the meantime the wireless operator, Sgt Jack Griffith, contacted an RAF-station in England and asked for his exact position (fix). In the Operations Record Book of No. 6 RCAF Group, show the following text: "Three fixes were requested from the aircraft of No. 419 Squadron captained by Sgt Neale, two of which were acknowledged. All fixes placed the aircraft between the target and the enemy coast." This statement was not very accurate, in fact the aircraft flew in the Arnhem area, North of the scheduled course. It can be doubted whether the crew really hoped to keep the plane flying till they reached the North Sea. A ditch with a damaged plane like this one would certainly have caused a direct splash into the sea without any chance of an escape from the Halifax into a life raft , let alone being rescued by a Navy unit. Fortunately the crew had nothing to decide upon in this respect. The damage to the Halifax caused a lot of drag, and the remaining inboard engines were not in a position to keep the Halifax airborne for a long time. Even with both engines at full power the plane kept loosing height and a forced landing proved inevitable. At last JD214 made a belly landing at a small open meadow between the cherry orchard of the farm "De Els", (Two brothers rented this farm, one of the brothers was married but had no children, the other was single. Th. Klein Mentink was the main tenant. They would have rented the farm from about 1938.) located at the Burgemeester Knoppersweg at Indoornik. The open meadow, where the Halifax landed, belonged to Mr van Maanen. On the first contact with the ground both outboard engines broke away from the wings and marked the impact point with black scrape heaps. However , the Halifax slid on over the grass till it came to a halt just a few yards from the farmhouse "de Els". The Halifax was in a very bad state then. The fuselage was blotched, holed and almost completely broken in two behind the cockpit. The starboard stabiliser hung loose and characteristic arrow pointed downward instead of ahead. Most remarkable were the missing engines, the black burned firewalls of which gave the impression the engines had been cut off by the blow of a mighty sword. A sword that, by coincidence, neatly removed the tips of the port propeller too. But the Halifax was not on fire anymore and the crew could leave her without difficulties. It is almost incredible that such a large bomber could land on a meadow as small as a football field, surrounded by orchards. But the captain did it and his skills saved the lives of the whole crew. 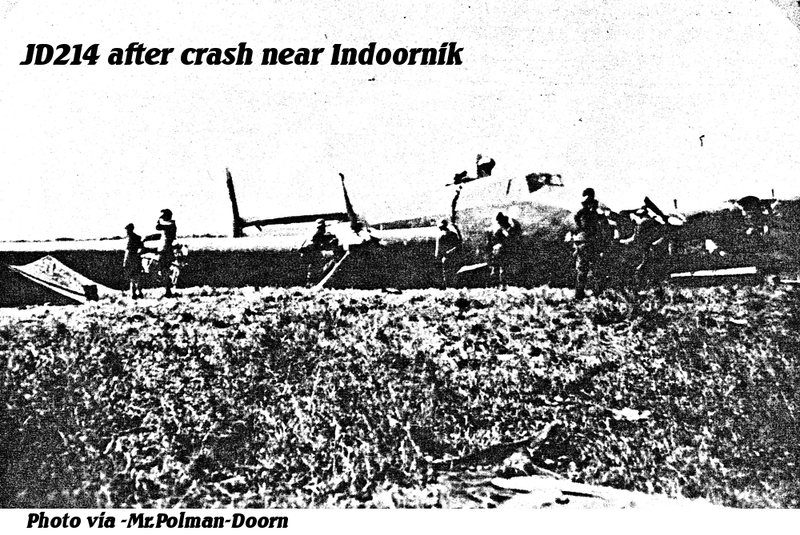 Naturally the crash was a real happening for the inhabitants of Indoornik, in particular for the farmer and his family. Awakened by a terrible noise "like a bunch of galloping horses towing a heavy steamroller over the road", the farmer could hardly believe his eyes when he looked out of his window. The huge mass of the Halifax almost obscured his sight and seemed to be even larger when, from time to time, the outlines were stressed by the flickering light from the burning engines in the background. Although the farmer did not confess this, it is likely that he preferred to stay in the farm and made no efforts to contact the embarking crew of the Halifax. He cannot be blamed for this. For the people in the occupied countries it was not allowed to leave their homes during darkness, and the trigger-happy German soldiers often proved that it was very unhealthy to disregard this rules. The people outside his farm, whether German or British, were certainly members of a military force. So it was wise not to interfere with their plans, whatever these were. Then the Halifax crew, after some discussions, decided not to stay together but make their escape effort by leaving the aircraft in three separate groups, walking in different directions. After the crew left, the morning light gradually showed the remains of the Halifax in its real deplorable state. The farmer and some others than looked after it and they had ample sufficient time to do so. The wreckage laid at a rather hidden place and could not be seen from any public road. As a consequence the Germans discovered it at noon, after they apprehended some of the crew. As already told, the crew left the Halifax in three small groups, going in different directions: West, South and North. The air gunners Sgt McLeod and Sgt Dave Kenwell walked to the West. Although little is known about their adventures, it's likely that they walked along the villages Andelst and Hien to the town of Opheusden. Presumably they tried to escape along the railroad to Kesteren, a rather risky affair as railroads were always heavily guarded by the Germans in order to prevent sabotage. Anyhow, both the air gunners were arrested near to the Dalwegen railway station and brought to Arnhem for interrogation. After that the navigator Sgt Ross McLachlan and the bomb aimer Sgt Bill Jaffray had hidden themselves in a small clump of bushes, within sight of a farmhouse and a road. Here they hid their parachutes and maps. Then they headed South, and crossed the small bridge over the small river Linge, and walked along the Molenstraat and Molenpad in the direction of the village of Hemmen. After passing the farm "De Hucht" they followed the Zettensepad and met Mr. Bart Franken, who was on his way, to his daily work at Castel Hemmen. Around 06.00 hrs he accompanied the Canadians to the cherry orchard of Mr. Jan Lutterveld, and seeing that the arm of Sgt Ross McLachlan needed medical care, he then showed them the way to doctor A.J. de Hullu. After a "breakfast" of cherries, the sergeants walked along the Hoofdstraat (the main street of Hemmen), passing the house of the headmaster of the Normaalschool and the pub "De Blauwe Steen", and then entering the Bakkerstraat. In the Bakkerstraat they met Mr. Roelof Polman, now a teacher in the central part of the Netherlands. Mr. Roel Polman was just awoken at that early hour. He heard unfamiliar voices outside and saw two persons in unknown uniforms, so he decided to look after them. Being a High school student at that time, he soon realised these persons could only be Englishmen. Roel Polman wanted to know more about this and he went outside and started to talk with the two Canadians and lead them to the home of doctor de Hullu. In the meantime the street became rather crowded as many villagers saw or heard about the "procession" and everyone liked to have a look at these unexpected friendly guests. When they arrived at the doctor's, Sgt. Ross McLachlan asked for the toilet, when he walked to it, he got unwell, Roelof Polman was able to catch him, after this small incident the doctor treated Sgt McLachlan's wounds and told them that he was not in the position to hide them. Too many people had seen them and it was very likely that at least one of them would inform the Germans in order to obtain some kind of a reward. And that he was scared that the Germans would come in and also take severe retaliations to him and his family. There was also no other option than to inform the local constable, Mr. Lassche, who brought the unhappy Canadians to the police station (according to Sgt Ross McLachlan to the house of the constable) and inform the German authorities and asked them what to do. A few hours later they received a message by two Germans who arrived on a motorcycle, that the two sergeants were to be brought to Arnhem by bus. In the room of the family Hofman arrived, there were outdoor flowed together, many citizens tried to give the Canadians fruit and, because of the orange colour, marigolds to offer. All this happened by a open window . When it was also patriotic songs, such as 'In the name of Orange, do open the gate ', began to sing the supervisor got very concerned. This got worse when he saw that a Zettense W.A. man from remote distance observing everything. To be more freely, he closed the window. Shortly afterwards came the bus (from Velox) and that stopped at 5 metres from the store. When the three men stepped into the bus, the population raised the Wilhelmus (the National anthem). This was a dangerous game, but fortunately there were no counter-measures. Thus began the journey to captivity. The three remaining crew members; Sgt George Neale, Sgt Reg Cleaver and Sgt Jack Griffith, after crossing the small bridge over the Linge, they went in East over the Weteringsewal in the direction of the village of Elst. After a long walk they reached a farm in which they met Mrs. Connie Albracht-van Oord. It is not known what went wrong then, but in some way or another the police got informed about their whereabouts. The Germans arrived and the three crew members were transported by a German Army truck to the Waffen SS Headquarters in Arnhem for interrogation. The next day (June 26th) the whole crew were ferried to Amsterdam and kept in prison for five or six days. Then they travelled along K�ln and Bonn to an German Air force Inquiry Camp at Oberursel, a village North of Frankfurt am Main. After 10 days in solitary confinement they were interrogated and then released to the less restrictive compound. In July, 1943, they were send to the POW-camp "Stalag Luft VI (L6)" located near the town of Heydekrug, Memelland (now �ilute in Lithuania). On July 15th, 1944, when the Russian Army approached, they had to been moved. First to Stalag 357 near Torin in Poland, they arrived here on July 16th, 1944. Here they stayed till August 8th, 1944, and then they were moved to Stalag XI-D, located just to the east of the town of Fallingbostel, arriving on August 10th, 1944. This was a camp next door to the concentration camp Bergen-Belsen. The latter camp was an emergency camp without facilities whatsoever. As the food situation in Germany was very bad at the time, the prisoners too had almost nothing to eat or drink, many prisoners had to steal food in order to survive. This "robbing" combined with the approaching defeat of Germany, led to utmost nervousness of the guards and to deplorable accidents. Without any reasons a German guard fired at Sgt Dave Kenwell. Unfortunately he was wounded in the arm, and the bullet could be removed by another prisoner, a French doctor, the arm could be maintained. After this incident, the camp commander ensured that Sgt Kenwell received proper medical treatment and care. At this occasion the use of dumdum bullets was suggested. Although such rumours often turned up during WWII, the use of such bullets was never proven. In March, 1945, Sgt Bill Jaffray managed to escape from the camp, and after a lot of wandering around he finally reached the Allied Lines. On the 22nd of April 1945, he was again in England and has stayed for 6 weeks in a hospital to become from his hardships. After that he went on leave, before he went back to Canada he visited his family in Scotland. On 16th of April 1945. the POW camp was liberated by British troop of the Second Armoured Division. They arrived back in England at the end of April, 1945. What was happening by the JD214 after the 25th June?? So much for the adventures of the crew of Halifax JD214, and we return back to the Halifax, where later that day, German security had arrived. Before that, someone had already scrapped many things from the plane. It was said that some farmers used this time well by removing usable materials from the bomber and filled milk jugs with gasoline from the fuel tanks. Although some "robbing" could have taken place, this story seems to be rather exaggerated. In the first place the Germans were fully acquainted with the equipment fitted in bombers; missing material would therefore certainly have led to serious retaliations to the farmers. In the second place the high-octane fuel from the Halifax, if it could be removed, was hardly of any use to cars or the rather outmoded farmer machinery from that period. But the Halifax certainly served another purpose much more effective. It became a sight-seeing object for many civilians that came from far away in order to buy cherries from the orchards around Indoornik. During the following days the weather was very fair and dozens of people queued up on a narrow path along the wrecked Halifax. The Germans made no objections to this "pilgrimage" and the happy farmer never sold his cherries so easily. Mr. Cees Troost remembers well how students of the technical school, adored aluminum plates, to make so-called snake bracelets for a girl. From Plexiglas they made rings with three slots in it, which were filled with red, white and blue paint or they fabricated there pendants with a dime into it. Also of great nuts, rings were made. An incident that occurred was that a German motorcycle with side-car, drove away from the plane. A loud barking dog ran after the motorcycle, on which a Feldwebel in the sidecar was so angry that he stood up and shot at the dog, fortunately without hitting him. Some of the German guards were twiddling their thumbs, then one of them came on the idea to go playing with the young horses in the meadow next to the plane. One of the horses was seemingly not amused of this idea, and turned and stretched out his hind leg with a huge blow against one of the German soldiers, who later died as a result of the injuries. In 1970 the Mayor of Wageningen received a letter. The address was Wegeningen, but the Postal service gave the letter yet in the right place. The letter came was from Mr McLachlan. In this letter he asked who had been his helper and interpreter in 1943. He remembered vaguely the first name Rolfe. Because he thought his plane had fallen near Wageningen enable to give a answer, the letter was passed on to the local newspaper "the Veluwe post" and this newspaper held an extensive search, but without result. This was a grievous setback for Mr McLachlan, all the more because he wanted to pay a visit to Wageningen in July 1970. During his visit to Wageningen and go searching for landmarks in the Binnenveld and in Kraats, also without a result. When Joop Siepermann from Wageningen, in the beginning of 1983 got the newspapers in his possession, he had written to Canada for further information from Sgt Ross McLachlan. When he got an answer from Mr McLachlan, he got in contact with Mr Cees Troost, which, together with the "World War II Working Group" of the historical Circle Kesteren and surroundings, investigated crashed planes in the war between Rhine and Waal. When Cees Troost viewing this documentation, he came across the names of the unit of McLachlan and Jaffray and there crash site was localized. After many people near the crash site asked for information about who our Rolfe was, he eventually came through the family G. den Hartog to the name and address of the requested helper. This was on a Friday night and too late to make a call. This Cees Troost have done so the next afternoon. He got in contact with the vacation residents of Huize Palani and notice that the family early in the morning for 6 weeks had left for a holiday. So he had to be patient. After the holidays, Cees Troost, called again. Then he had more luck. The requested helper was found. And made an appointment for an interview. A whole evening, along with Joop Siepermann and Roelof Polman and his wife talked about the case and what information is exchanged. Roelof Polman had written to Canada and still to day had no answer.